In the latest trailer for John Wick: Chapter Three – Parabellum Keanu Reeves as John Wick asks Ian McShane as Winston – the owner of the Continental Hotel and a powerful figure in the criminal underworld – if the hotel’s services are still off limits. Winston replies, “What do you need?” “Guns. Lots of guns,” says Wick. Also joining Keanu Reeves for the chapter three are Laurence Fishburne (Mission: Impossible III), Lance Reddick (White House Down), Mark Dacascos (Lucky Day), Asia Kate Dillon (Billions, Orange is the New Black), Saïd Taghmaoui (The Missing), Jerome Flynn (Game of Thrones), Jason Mantzoukas (The Long Dumb Road), Tobias Segal (The Good Wife), and Boban Marjanovic. 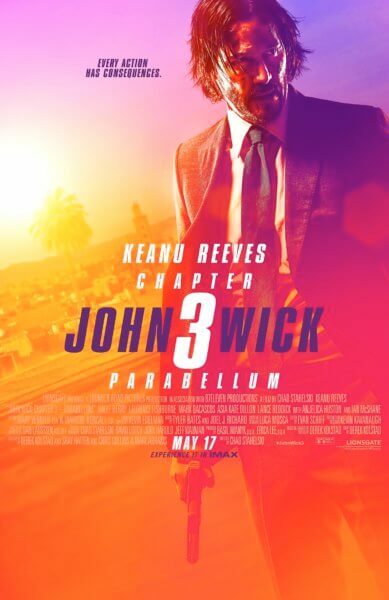 John Wick: Chapter 3 – Parabellum was directed by Chad Stahelski, director of John Wick and John Wick 2, from a screenplay by Derek Kolstad, Shay Hatten, Chris Collins, and Marc Abrams. Kolstad created the characters. Basil Iwanyk and Erica Lee served as producers. The behind the scenes team includes director of photography Dan Laustsen, editor Evan Schiff, production designer Kevin Kavanaugh, and costume designer Luca Mosca. The third John Wick film will be released by Summit and Lionsgate on May 17, 2019. In this third installment of the adrenaline-fueled action franchise, super-assassin John Wick returns with a $14 million price tag on his head and an army of bounty-hunting killers on his trail. After killing a member of the shadowy international assassin’s guild, the High Table, John Wick is excommunicado, but the world’s most ruthless hit men and women await his every turn.